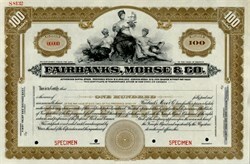 Beautifully engraved certificate from the Fairbanks, Morse & Co. in 1923. This historic document was printed by the American Banknote Company and has an ornate border around it with a vignette of three allegorical figures. Fairbanks Scales is a privately owned company in Kansas City, Missouri, that manufactures the scales. Fairbanks Morse Engine (FME), a subsidiary of EnPro Industries, is a company based in Beloit, Wisconsin, that manufactures and services engines. Fairbanks Morse Pumps is a part of Pentair Water in Kansas City, Kansas, and manufactures pumps.